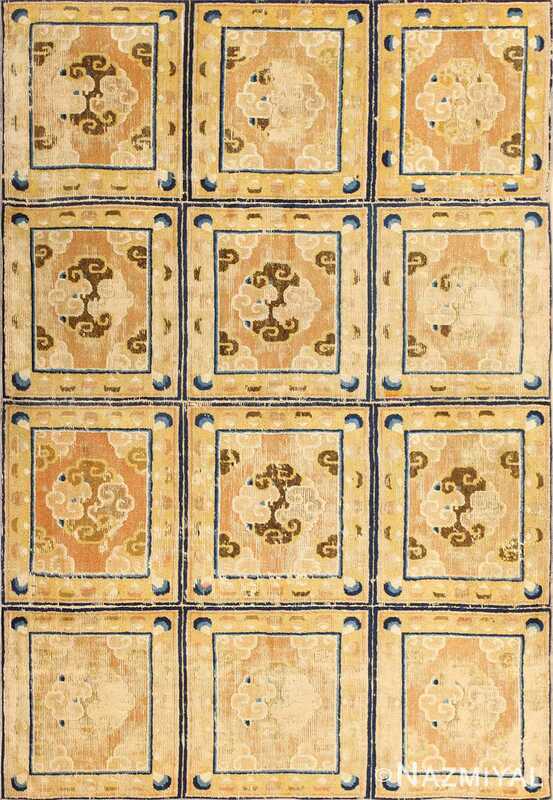 This exquisitely subtle and restrained antique Oriental Chinese Art Deco rug is graced by a scalloped border of dark brown enclosing a golden sand field. Vintage Chinese Deco Rug, Origin: China, Circa: Early 20th Century - Here is an exciting and appealing antique Oriental carpet - an antique Art Deco rug that was designed and woven in China during the early years of the twentieth century. 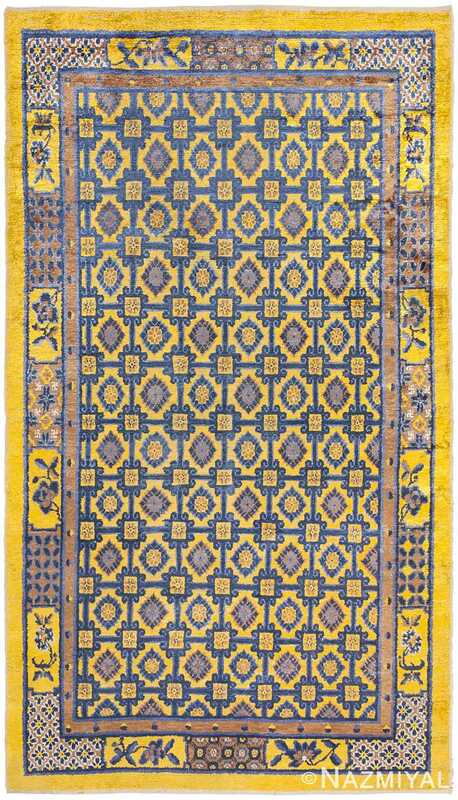 Heavily informed by the aesthetic inclinations of the Art Deco period, this unique carpet is a compelling and thought-provoking example. A scalloped border of dark brown encloses a golden sand field on this exquisitely subtle and restrained antique Chinese Art Deco. At first the field appears empty or open, but it is actually covered by a tone-on-tone design of scrolls and cloud-bands emanating inward from the outer edges. 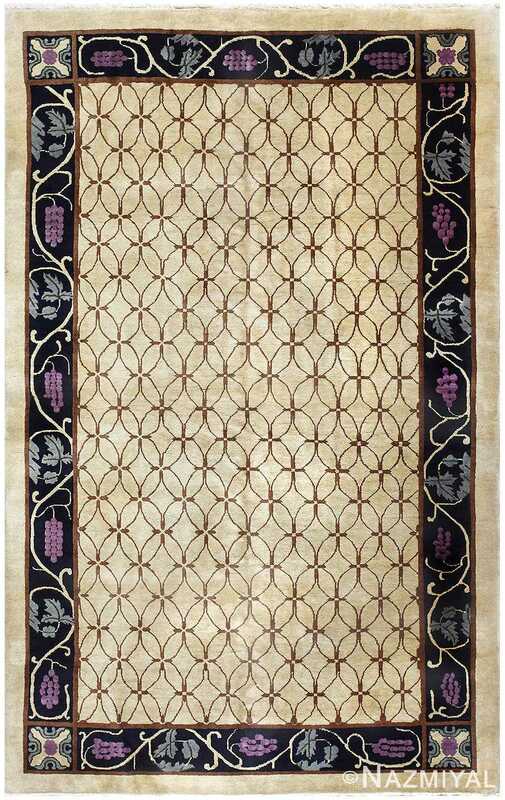 In their sinuous rhythms they echo the scalloped forms of the border and continue its visual effects across the carpet in a more subdued manner. This carpet testifies to the masterful design sensibilities of Chinese weavers as they made the transition into the modern world. 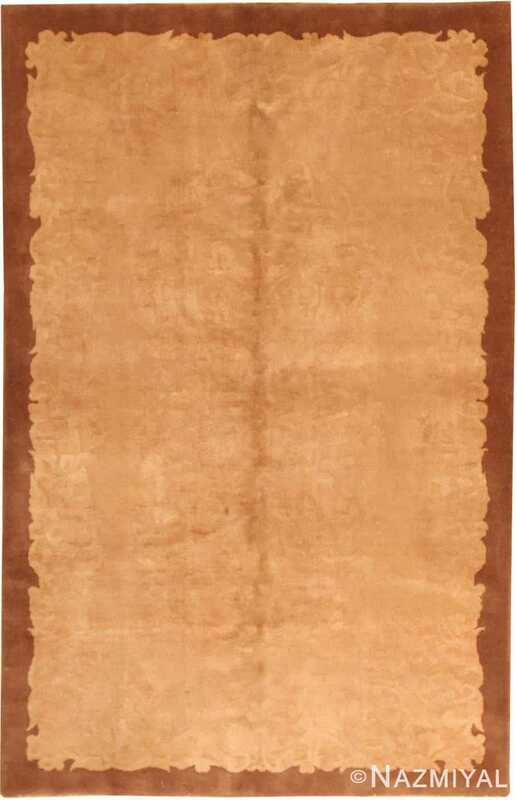 The Art Deco movement had an outside influence on the world of art and design, and some of the most important qualities and characteristics of that movement may be found in this fine rug. Dramatic blossoms arranged in intricate scroll work tiles create a stunning repeating pattern that decorates this richly colored antique silk rug from China.